The RadioTime plug-in for Windows Media Center brings all the streaming radio stations of the world to your couch. For free. 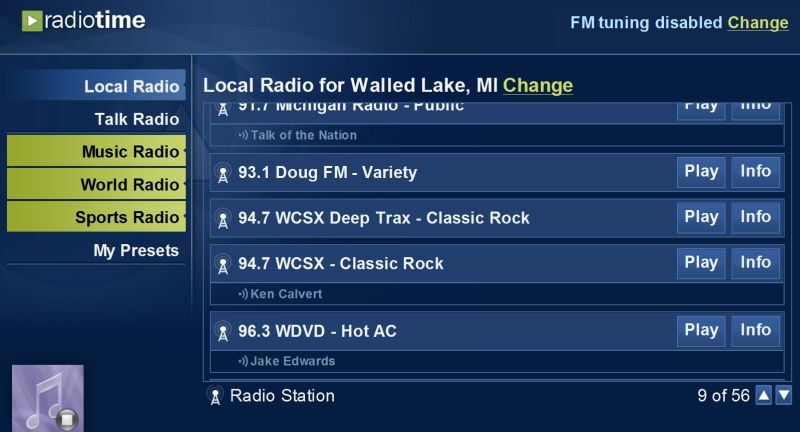 It's a little-known fact that Windows Media Center can tune in local FM radio stations--provided, that is, you have an FM tuner connected to your PC (some internal TV tuner cards include one) and a good antenna. Hey, this is the Internet age, right? Why mess around with 80-year-old technology that pulls in maybe two dozen stations (if you're lucky) when you can stream over 100,000 radio stations from across the planet? RadioTime is a free radio-streaming service that lets any computer user do exactly that. But if you're a Windows Media Center user, you can grab the RadioTime WMC plug-in and "surf" the airwaves right from your couch. After installing the plug-in (I recommend using the Get the installer link on the product page), just fire up Windows Media Center and head to the Extras section. Click the RadioTime icon, then choose your desired category: Local Radio (on my system it automatically detected my location), Talk Radio, Music Radio, World Radio, or Sports Radio. There's also a My Presets option, which is kind of like a Favorites area, but you have to sign up for a free RadioTime account in order to use it. Speaking of which, the plug-in is also free. While you're at it, why not grab the My Channel Logos plug-in and soup up your channel guide with network logos? It's equally awesome.